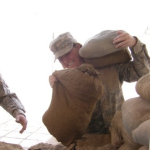 You are here: Home / Guest Posts / One woman’s military life. Is this how it is? Every morning I’d wake up feeling the stress of not having enough sleep the night before. We shared the bunk area with sixty other women in our platoon. All of us were strangers from across the states, a few even from Puerto Rico. Every morning it was rigorous exercise, followed by rigorous exercise in the afternoon, and rigorous exercise in the evening. Socializing with others wasn’t even on anyone’s radar. Those first few weeks were the worst simply because of how utterly alone we all were. We didn’t even start receiving mail from loved ones until the third or fourth week. Being removed from all of the comforts of beauty products was another hurdle. There was no make-up, at all. We weren’t allowed to bring any hygiene products with us. The only approved hygiene products were those sold on post. Just imagine: not being able to use your own face wash, body wash, shampoo, or conditioner for three months. We also weren’t allowed to have razors. There were no haircuts, no lip waxing, and no tweezers for eyebrows. But then, something amazing happened. If one of the girls was falling behind during a run, we’d shout encouragement to them, or trail back and make sure we paced them back up to the front. If a girl was having trouble carrying her gear on a ruck march, we would shoulder her burden by lightening her load. One of the milestones we had to cross was belaying down a 300-foot tower. There were so many girls who had fear of heights, but we couldn’t move on until each and every one had jumped off that tower and trusted in the one belaying them from below. We were there for each and every one, comforting and encouraging them to go on. We went this training with the men as well, but as women were already isolated in living quarters, it was really just the women sticking together that got us through it. After finishing basic training, I was accustomed to the physical requirements for the military and had the discipline to keep myself at that standard for the rest of my career. But when it comes to other types of strength, it takes a bond stronger than just friendship. It takes the encouragement and love of female peers to conquer every obstacle. It takes a comforting shoulder to cry on in the middle of the night when they can’t remember the last time they talked to their loved ones. Women tend to stick together in all types of situations, but in the military there is no question about it. To tough it out as a woman in the military, you need other women. Teresa DeLuca is a native to Chicago and loves traveling. When she isn’t bartending, she spends her time in the gorgeous weather with her cat Jim. She has loved writing from a very young age but has never been published before. The rotating banner features a female soldier named Gina who served on deployment in 07-09 with a MilSuccessNet team member.